Varanasi, one of the world's oldest living cities, is rightly called the religious capital of India. Also known as Banaras or Benaras, this holy city is located in the southeastern part of the state of Uttar Pradesh in northern India. It rests on the left bank of the holy river Ganga (Ganges) and is one of the seven sacred spots for Hindus. 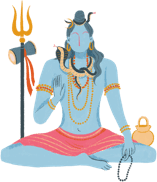 Every devout Hindu hopes to visit the city at least once in a lifetime, take a holy dip at the Ghats of the Ganga (the famous steps leading down to the water), walk the pious Panchakosi road that bounds the city, and, if God wills, die here in old age. Both Hindus and non-Hindus from around the world visit Varanasi for different reasons. Popularly called the city of Shiva and Ganga, Varanasi is simultaneously the city of temples, the city of ghats, the city of music, and the center for moksha, or nirvana. For every visitor, Varanasi has a different experience to offer. The gentle waters of the Ganges, the boat ride at sunrise, the high banks of the ancient ghats, the array of shrines, the meandering narrow serpentine alleys of the city, the myriad temple spires, the palaces at water's edge, the ashrams (hermitages), the pavilions, the chanting of mantras, the fragrance of incense, the palm and cane parasols, the devotional hymn—all offer a kind of mystifying experience that is unique to the city of Shiva. Legends regarding the origin of Varanasi abound, but the archeological evidence suggests that urban settlement of the area began in about 2,000 BCE, making Varanasi one of the world's oldest continuously inhabited cities. In ancient times, the city was famous for its production of fine fabrics, perfumes, ivory works, and sculpture. Buddhism is said to have started here in 528 BCE in nearby Sarnath when the Buddha gave his lecture on the first turning of the Wheel of Dharma. By the 8th century CE, Varanasi had become a center for the worship of Shiva, and accounts from foreign travelers during the medieval period show that it had an unsurpassed reputation as a holy city. During the occupation by the Persian Empire in the 17th century, many of Varanasi's Hindu temples were destroyed and replaced with mosques, but in the 18th century, modern Varanasi began to take shape as Hindu-led governments facilitated the restoration of temples and the building of new shrines. ....older than history, older than tradition, older even than legend, and looks twice as old as all of them put together. The former name of the city, "Kashi," signifies that Varanasi is a "site of spiritual luminance." And indeed it is. Not only is Varanasi a place for pilgrimage, it is also a great center of learning and a place known for its heritage in music, literature, art, and craft. Varanasi is a cherished name in the art of silk weaving. The Banarasi silk sarees and brocades produced here are prized all over the world. The classical musical styles, or gharanas, are woven into the lifestyle of the people and are accompanied by musical instruments that are manufactured in Varanasi. Many religious texts and theosophical treatises have been written here. It is also the seat of one of India's biggest universities, the Banaras Hindu University. 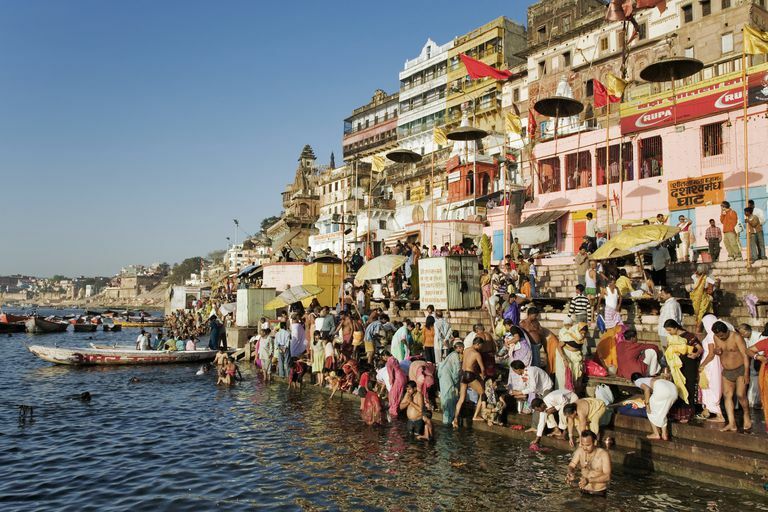 To the Hindus, the Ganges is a sacred river, and any town or city on its bank is believed to be auspicious. But Varanasi has a special sanctity, for legend has it that this is where Lord Shiva and his consort Parvati stood when time started ticking for the first time. The place also has an intimate connection with a host of legendary figures and mythical characters, who are said to have actually lived here. Varanasi has found a place in the Buddhist scriptures, as well as the great Hindu epic of Mahabharata. The holy epic poem Shri Ramcharitmanas by Goswami Tulsidas was also written here. All this makes Varanasi a significantly holy place. Varanasi is a veritable paradise for the pilgrims who throng the ghats of the Ganges for spiritual reward—deliverance from sin and attainment of nirvana. The Hindus believe that to die here on the banks of the Ganges is an assurance of heavenly bliss and emancipation from the eternal cycle of birth and death. So, many Hindus travel to Varanasi at the twilight hour of their life. Varanasi is also famous for its antique temples. The renowned Kashi Vishwanath Temple dedicated to Lord Shiva has a lingam—the phallic icon of Shiva—that goes back to the time of the great epics. Skanda Purana by Kasikanda mentions this temple of Varanasi as Shiva's abode, and it has withstood the onslaught of various invasions by Muslim rulers. The present temple was rebuilt by Rani Ahalya Bai Holkar, the ruler of Indore, in 1776. Then in 1835, the Sikh ruler of Lahore, Maharaja Ranjit Singh, had its 15.5 meter high (51 feet-high) spire plated in gold. Since then it is also known as the Golden Temple. In addition the Kashi Vishwanath Temple, there are other famous temples in Varanasi. The 8th century Durga Temple, situated on the Ramnagar Pandav road, is home to hundreds of monkeys that reside in the nearby trees. Another popular temple is the Sankatmochan Temple, dedicated to the simian-god Hanuman. Varanasi's Bharat Mata Temple is probably the only temple in India that is dedicated to the 'Mother India.' Inaugurated by Mahatma Gandhi in 1936, it has a big relief map of India carved in marble. Another relatively new temple is the Tulsi Manas Temple built in honor of Lord Rama in 1964 at the place where Tulsidas composed the Ramacharitmanas, the vernacular version of the epic of Ramayana. The walls of this temple adorn the scenes and verses depicting the exploits of Lord Rama. Other significant places of worship include the Sakshi Vinayaka Temple of Lord Ganesha, the Kaal Bhairav Temple, the Nepali Temple, built by the King of Nepal on Lalita Ghat in Nepali style, the Bindu Madhav Temple near the Panchaganga Ghat, and the Tailang Swami Math.